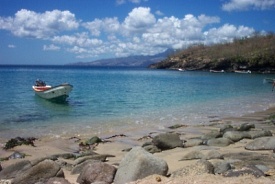 The garden island of Martinique is known as the "France of the Caribbean." The streets are lined with delectable cafes and trendy boutiques. The other attraction here is the natural splendor of the island, especially that of the interior rain forest region. The top shore excursions take tourists to St. Pierre, the city destroyed by the eruption of Mt. Pelee in 1902, and on a walking tour through the main town of Fort-de-France. Tropical garden tours and party cruises are also popular choices.